Schlitz train and group of revelers, celebrating the end of prohibition in Milwaukee. 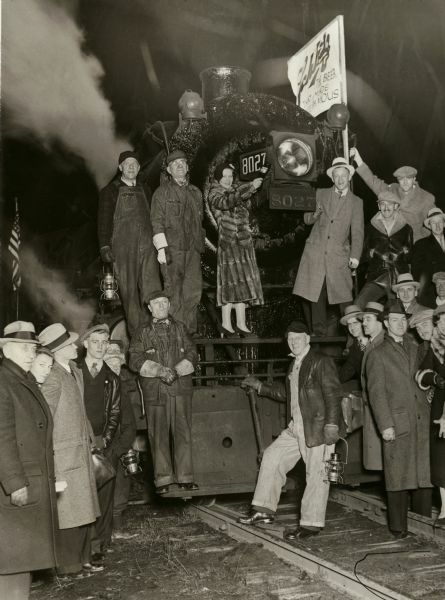 Schlitz Engine #8027 departs to deliver the first Schlitz beer at 12:01 a.m. on April 7, 1933. Pictured from left are R.D. Miller, Superintendent; (on front footboard) Jesse Worner, Yardman; (in front of draw casting) A. Basta, Fireman; Edward Wroblewski, (on running board above front beam) Anton Plewa, Conductor; (between Conductor and woman) and William H. Kay, Engineer. This image is one of many photographs, held in various collections, that document the brewing industry in Wisconsin. On 12/23 Milton Clark of Missoula MT emailed: "The locomotive is actually owned by the Chicago, Milwaukee, St. Paul & Pacific Railroad, the railroad that served the facility. It is a Class L-2 [2-8-2] built at the Milwaukee Shops in Jan 1913, renumbered 678 in 1938, and retired Jan 1951." The image appeared in the March section of the 1985 Wisconsin Historical Calendar.